Selecting 10 random minor characters--after this arc is over will be one week of one-offs. The top three get comics of their own! well what if it ends up a 10 way tie? to me, top three means we better vote up to three characters. Where are Fiddler and Keys? I needs me Fiddler and Keys fix! Also, there are no comics tagged for Tarmac and Gambit. Same with "Delusional Steve" Who are they? Last edited by RockstarRaccoon on Mon Mar 04, 2013 2:44 am, edited 1 time in total. yeah, the site search is crap. Maybe he wasn't delusional and they did come back. maybe he still thinks his owners will come back, but he's living a happy life with a loving family in the meantime. I think it's about time Jasper and Jinx get some focus. We need more cats. YAY! MY WISH COMES TRUE! Same for me. I been always a dog person, but it's true that we need balance the scales between dogs and cats. Also I never expected Delusional Steve could even have a chance since he was too extra, but it will be good to see him specially since he always seemed to me a really cool character (I even thought put him in a fanfiction, no kidding). I wonder if he even have the same name in the case he was adopted. Same for Pap, who would be the equivalent of Nermal I suppose XD. Besides we need more kids, the only ones who are in this comic are the wolf cubs. So my choise would be Delusional Steve, Jasper and Jinx, and Pap. Last edited by Gren on Mon Mar 04, 2013 1:55 pm, edited 1 time in total. Original choice for me was (obviously) Tarmac and Gambit. Dem otters need more love! Pap is also just one of those characters who I like cuz he's a tormentor. Tiger's gonna get T.O'd, I'm sure, which will be hilarious. When will the current arc end? My option went for J&J, Delusional Steve and Cerberus. Wanna see a girl's day off! Oh jeez this is a tough one. I guess my choices would have to be Jasper and Jinx, Pap, and Squeak. Ok now I feel dumb for not knowing who Pap or Poom is! Does anyone else know, cause I don't!? 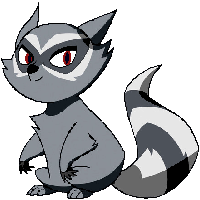 I think Squeak or one of the other characters that have had little screen time deserve a chance to shine. Although picking ONLY 3 of these characters has me doing some serious thinking. Also you should do this more often Mr. Griffin because it's fun to be interactive! Last edited by Duster on Mon Mar 04, 2013 12:06 pm, edited 2 times in total. Thank you very much! I would have never in a million yrs remembered who Pap was, but Poom... how did I forget Poom! At the time of this post, seeing Cerberus, Tarmac alongside Gambut, Squeak and Pap tied for 3rd comic... I picture them at the Zoo doing a cage match for third place. That would be difficult having that weird obsession with feet. I have been yelling about Jasper and Jinx having a comic for a year now! VINDICATION!!!!! So yes, Jasper and Jinx, the otters, and someone else got my votes. Cerberus vs. Jasper and Jinx? No Griswold, Karo or Crazy Old Man Who Only Speaks In Limericks (AKA Thaddeus Forsythe Strickland III)? Oh how I would LOVE to hear about Devo's -other- girlfriends! Where's Rufus? No love for Aussie Sheps! He used the only sensible method. Scraps of paper and darts! I voted for the zoo otters, Tarmac and Gambit. I think they have a lot of comedy and cuteness potential. You can choose at least three options. I'm currently happy with the polls the way they are now buuut, that's bound to change. C'mon guys I needs ta see more SQUEAK!! Let's just agree that Griswold seems to be a smart Aleck! Spinoff. The Adventures of Squeak! Co-starring Tarmac for some reason.